Apple's iOS has certainly gone a long way since it first saw the light of day. What Apple initially called iPhone OS gradually shaped itself as iOS, one of the leading mobile platforms that is quite unlikely to fade away in terms of popularity anytime soon. Tomorrow, Apple is about to unveil its 2015 crop of iPhones, the 6s and the 6s Plus, as well as the gold master version of iOS 9. The latter was officially announced at WWDC '15 and had a whole lot of its features demoed on stage We already seem to know quite a lot about it; we've even made a preview of this iOS version based on its beta. As usual, we expect Apple to showcase more previously unknown features of iOS 9 during its grand announcement. But how did the operating system, different iterations of which can be found on each and every iPhone, evolve? 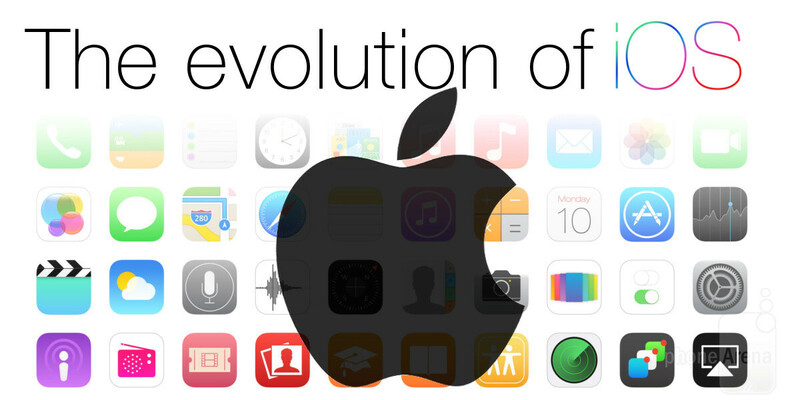 The anticipated arrival of iOS 9 on a device near you in the coming weeks inspired us to take a closer look at the evolution of iOS, from the very fist iPhone OS 1.0 all the way to the latest iOS 9. The first Apple smartphone, the Apple iPhone, arrived with iPhone OS, which was (naturally) the most basic representative of the platform. As such, it was devoid of many features that iOS users now take for granted. Unlike any other mobile OS at the time, Apple's one was solely focused on touch-based interaction since neither of Cupertino's devices came with a physical keyboard of any kind. For example, there was no App Store, as it did not exist at at the time; you couldn't either take a screenshot. Still, the first iteration of Apple's mobile OS hinted at the great potential that it held. The latest version of iPhone OS 1.x was 1.1.5, and interestingly enough, it was released after iPhone OS 2 had broken cover. Apple's iPhone OS 2.x, the second iteration of the platform that debuted in 2008, filled in some great holes in Apple's platform. Most importantly, it introduced the App Store, allowing iPhone & iPhone 3G users to download apps and games. Certainly, this update brought a lot of novelties to the OS, but among the more major and in-your-face ones were the standalone Contacts app (the contacts in your phone book were previously accessible via the Phone app) equipped with a neat search functionality inside and the new feature-rich scientific calculator that allowed you to solve more complex problems, among others new features. In 2009, Apple released the third edition of its mobile OS. Albeit not groundbreaking, iPhone OS 3.x brought a ton of features. The most notable ones are video recording, video editing, MMS messages, voice command (iPhone 3GS only), copy & paste, spotlight search, a landscape mode for the keyboard in Mail and Messaging, several new default apps like Voice Memos and Compass, and others. Since Apple's first tablet, the Apple iPad, got introduced in 2010 and was powered by the very same platform, Cupertinians had to rename the operating system. Hence, version 3.2 of iPhone OS arrived with a new name as well - iOS. iOS 4 arrived in mid-2010 and brought a host of new changes to the platform. The most noteworthy ones are wallpaper support and multi-tasking functionality, which were already default features on most of iOS's rivals. iOS 4 also employed more system-wide transition animations than its predecessors, flaunted an improved auto-correction functionality for the keyboard, unified email inbox as well as support for multiple exchange servers, and others. Apart from being more advanced than ever, iOS 4 was the first iteration of the OS to be incompatible with an iPhone - the original Apple smartphone was thrown out of the mix. The latest version of iOS 4, 4.2.1, was also not compatible with the iPhone 3G. It was announced that Apple's 2011 rendition of iOS, iOS 5, came with more than 200 new features inside. An impressive number, right? Well, many of these were pretty major ones - Notification Center, Siri, iMessage, iCloud, universal system-wide dictionary, deep social integration for Twitter, Game Center support, and others. Safari, the default web browser on all iPhones also got polished with the new reader mode, which allows you to experience a distraction-free version of the current website, tabbed browsing, and reading list. The Mail and Camera apps also received their fair share of attention. A host of new apps also got introduced alongside iOS 5 - Newsstand, which allows you to subscribe for different online magazines and newspapers, and the handy Reminders; meanwhile, others like Mail got revamped. iOS 5 was also the first representative of iOS that allowed users to update the OS over-the-air. In general, iOS 5 can be viewed as one of the more major functionality-oriented updates in the history of iOS. iOS 6 broke cover in 2012 and offered a host of improvements over its predecessor, namely a more intelligent Siri (which now gave you more detailed info on movies, sports, restaurants, and launched apps), a deep integration with Facebook (allowing you to share images and maps straight from various apps), a whole new map app, Apple Maps (the initial arrival of which can be defined as a fiasco), the ability to reply to calls with text, the ultra-handy Do Not Disturb mode, Passbook, which houses your boarding passes & store cards, further improved Safari, which came with offline reading, as well as pretty nice new features in Photo Stream and the native Email app. Some apps that came preloaded on previous iOS versions, like Google Maps and YouTube, got nixed and did not make an appearance in iOS 6 - undoubtedly a move that aimed to further reduce Google's part in Apple's OS business. Of course, both apps were up for grabs from the App Store. iOS 6 also introduced a ton of new privacy settings that enabled users to have a greater say in their privacy-related settings. Ever since the original iPhone OS, Apple's mobile platform has been donning almost the same, uniform looks with only minor visual improvements of the iconography, typography, and user interface. With iOS 7, however, Cupetino overhauled its OS, giving it new looks. Unlike its previous iterations, iOS 7 was fresher and more lively. The flat icons were a pretty stark departure from the skewmorphic roots of the first iPhone OS. Apart from the visual side of the changelog, iOS 7 also brought a ton of additional useful features. Just mentioning Control Center, day overview for the Notification Center, improved multi-tasking, enhanced Photos app, AirDrop, and revamped Safari browser (which now comes with full-screen browsing mode and swipe tabs) will make every iFan cherish September 2013, iOS 7's "birthday". Some additional new features that complemented the already-impressive changelog were the iTunes radio streaming, the improved voice for Siri, as well as the overhauled Contacts, Calendar, and Weather apps. The camera app also scored Burst Mode and Slo-Mo video mode, which allowed users to shoot clips at 120 fps. It also offers several new native filters to spice up your shots. Speaking of Photos, the default camera app had also scored the ability to take square Instagram-like photos. Unveiled in mid-2014, iOS 8 can be easily considered the most open variation of Apple's OS to ever grace an iPhone. It introduced support for third-party keyboards and widgets in the "Today" section of the Notification Center, which brings it several inches closer to what Android has been offering to the wide public for some time around. Other improvements that arrived with iOS 8 were the interactive notifications that pop up from the top of the screen, which now allow you to quickly respond to or mute them. In addition, the multi-tasking menu now displays your favorite and frequently-accessed contacts. We mentioned the third-party keyboard support above, but iOS 8 introduced another keyboard-oriented novelty - it provides users with improved word and phrase suggestions. An improved Spotlight search feature was also a part of the mix, while Reachability improves single-handed usage. Further-perfected Photos app and improved Siri, as well as Continuity (which allows you to continue your work on another compatible OS X Yosemite device) are also features that iOS 8 arrived with. We should also mention Health, Apple's ambitious fitness and health data dashboard, which gives you an insight at your vital stats. Unveiled at WWDC '15, iOS 9 is this year's version of Apple's mobile platform that is mostly an incremental update over last-year's iOS 8. The majority of its features got officially demoed by Apple on stage and include multiple updates to Siri, which is about to get proactive and smarter than before, improved Spotlight search, multitasking for select iPads, and battery-friendly Low Power mode. Additionally, Apple Maps and Apple Notes got enhanced with many new features and UI improvements, better security, and a revamped app switcher. It was also the first iOS version to be openly available for public testing. As Apple is widely rumored to include Force Touch in its 2015 batch of phones, we expect that the final release of iOS might feature a host of additional new features that will make use of said functionality. We won't be surprised if Apple shows us a whole lot of added features. We will know more on September 9, when Apple will hold its iOS 9 keynote in San Francisco. I think i still prefer ios 6 looks over 8-though 8 has been my favorite so far. Basing my opinion strictly off of visual appeal, iOS 6 is the best of the releases. iOS 6 is my favorite !! I have to agree, every time I see iOS6 screenshots it brings back so many great memories and it still looks classy and just good. iOS7 brought many useful features and overall I like its design alot (although not as much as Lollipop's) and it's worthy update IMO. I will take iOS 6 as well. You forgot to finish what you were typing. Let me finish it for you. "I"... am an ignorant and arrogant subjectivist that acknowledges no one but Samsung. I haunt Apple articles, shouting "iSheep! iSheep! iSheep!" at everyone around me who does not portray the same cooresponding beliefs that I religiously chant in every article, ironically showing the same traits as the same people I call "iSheep". I believe that my beliefs are the only true commandments everyone on this revolving planet should follow. I shout names at homosexuals because the leader of the company I hate most is a homosexual. I am an obnoxious coccydynia who will only preach buncombe's all day, in any Apple article I see. I am nothing but a lost and mindless cacafuego, only to which I will ruin any pro Apple article written by any author on PhoneArena. I complain and nag about this website, even though I come back every day, every hour, with nothing but one objective: to spew my one minded black and white opinion all over the comment section. Damn dude, that's like the post of the year lol. He didn't even bother responding to that hook. Would you post the same for the Apple fans that do the exact same thinsg in Samsung articles? NOPE!!!! So actually you are equally as bad as he is. Android is software, Apple is a company. Those things aren't things that can be copied, Someone simply is first to implement them, try to try lo harder. But when Apple implements them first and someone else does it, you guys call it copying. RIGHT? In fact I know I seen you hit on Samsung saying they copy. RIGHT? Come on now, don't be a hypocrite. Just be reasonble and real. By definition, is I do something someone else has done already, then it is copying. The difference here is, Apple fans will hate things like big phones, QHD, and all those things you mentioned, until Apple gets it and then its awesome. All the guys saying Apple would never make a big ugly iPhone liek the iPhoen 6 Plus when it was leaking. An BOOOOOM!!!!!! It was 100% EXACTLY RIGHT. Apple stated, they could not make a small iPad that wouldn't be a piece of sh!t. The very first iPad mini was exactly that, a piece of sh!t. It shoudlnt have been since they already had been making iPads for several years. Then after bragging about how premium metal phones are, they go backwards and make the iPhone 6C, which was a plasticity pastel ugly colored phone where they shoved in more iPhone 5 leftover parts. All those thinsg you mentioned can be copied. The difference here is, with PC's none of the PC users will say Dell copied HP if HP got a super highres display first. Only Apple's fans with their insecurity would ever mentioned such. Their next step will be iOS 9 jellybean. dont really see much changes in apples ui from 1-6. some big changes were made from 7-8 though. not saying its a bad thing. I don't see any difference if you ask me. iOS 8.3 brings lag to my 6 plus. I actually think the resposiveness of iO.S before iO.S 7/8 was the best, it just had that silky smooth interaction , nowadays it's fallen of grace, the multi-tasking switcher isnt as resposive and they are areas where they are jerks and stops for no reason , iO.S under steve jobs didnt change visually but felt so much more fluid and had that killer instantaneous response that made the iPhone famous. still iO.S 7 brought my 2 fav featues , control center and infinite folders. so you think theme changes = new O.S ? You consider moving from 32bit to 64 a theme change? Maybe you should sit this one out, champ. exactly I was being sarcarstic ! these s-fans think a new icon pack and homescreen looks is enough to be called a new O.S , just becasue iO.S started with a great look while Android started with a fugly design and got better with more upgrades., it doesnt mean each O.S didnt bring some good imrovements to the table. I'm still in awe how the biggest change to come to iOS is a theme pack, with every other update being basically a mass stock apps update. No framework changes, nothing under the hood, just basically adding bit by bit to the initial iPhone OS without ever having to build a version from ground up.